At the end of March in 2015, the Japanese government passed the 2015 Tax Reform Proposal. Among other policies included in the new law was the “exit tax provision”. You may have heard about this in passing from friends our colleagues. In short, what the law seeks to do is crystalize any taxable gains on your financial assets when you permanently leave Japan. For the time being, the good news is that this law primarily applies to high net worth individuals and may not be applicable to your situation at this moment. However, it is still imperative that all foreigners living in Japan be made aware of the primary details of the Japan exit tax. Should there be any changes to your personal financial situation, or any future changes to the law; you may find yourself falling under the tax regime. As has been seen in other countries, exit tax laws are quite complicated and are simultaneously updated over the course of a number of years as they are rolled out, while local governments gauge their effectiveness. For example, there has yet to be sufficient clarification on whether or not employee vested stock options are to be included in the exit tax. For the time being the main function of the law is to, upon your exiting Japan, mark-to-market all specified financial assets, and then impose a tax on capital gains where appropriate (even if you haven’t sold them). It is important to note that this does not mean the Japanese government will force you to sell the assets and realize the gain. They are simply treating it as if you had sold the assets, and accordingly sending the bill for the capital gains tax. As mentioned, it is likely that the exit tax does not yet apply to you. For example, if you are a foreigner living in Japan, the tax does not apply until 5 years after it was passed in 2015. That said, June 20th 2020 is rapidly approaching. As of writing this article, almost half of the grace period has elapsed. In addition, as is the case with most exit taxes, the law is designed to prevent wealthy individuals from moving large amounts of their wealth overseas in an effort to escape Japan’s taxes. As such, at the moment the tax is only levied on individuals with financial assets in excess of 100 Million JPY (or currency equivalent). However, it is not guaranteed that this lower threshold will not at some point be reduced. Another important note is that it is not necessary for just one asset or class of assets to be in excess of 100 Million JPY. 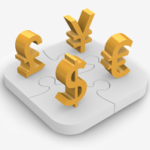 The government looks at the total aggregate value of all financial assets in order to determine if you are over the threshold and then taxable upon exiting Japan. Notably not on the list are any holdings in real estate and other fixed assets. This is likely due to the fact that it is quite difficult to take a building with you if you were to move overseas, and as such the Japanese government will have no difficulty in continuing to tax the asset after you leave. Also not on the list are any cash holdings. This should come as no surprise however as, aside from foreign currency speculation, there is no taxable gain to be realized upon leaving Japan. However, take the case where someone has substantial financial assets, but falls just short of the 100 Million JPY threshold. In this example, this person however also has substantial cash holdings which, if included, would push him over the limit. This however would not be the case, as at the moment the tax code does not allow for inclusion of cash holdings in the threshold calculation. Another key asset class which is not on the list of taxable assets is insurance. As elaborated in other insights articles, insurance policies can take many forms, and in some cases can carry substantial encashment values and investment capabilities. Depending on your nationality and eventual country of residence, there may be considerable tax benefits such as gross rollup, tax benefits on withdrawal, or tax reduction when considering inheritance tax planning. In this regard, wrapping your investments in an insurance contract could protect your assets from the exit tax if you decide to leave Japan. If those subject to the exit tax plan to transfer ownership of the assets to someone else or some entity outside of Japan, this unfortunately will not negate the tax. Making such gifts or inheritance transfers will be treated the same as above, and any unrealized capital gains will be applied the tax. If you find yourself falling under this tax regime and plan to leave Japan, you should seek to appoint a Tax Administrator. If you appoint a Tax Administrator prior to departing the country, the financial assets will be taxed on capital gains given a mark-to-market on your actual departure date. If you do not appoint a Tax Administrator prior to leaving Japan, the tax will need to be paid 4 months prior to your departure date. What may not be readily apparent, is that this would indicate that if you leave Japan without having appointed a Tax Administrator or without having already paid your taxes, then you could automatically and immediately become deemed tax delinquent as of 4 month prior, and subject to any penalties and/or interest on taxes owed. What is exit tax? What does it cost? As an expat what should I know?